Here is Twilight! 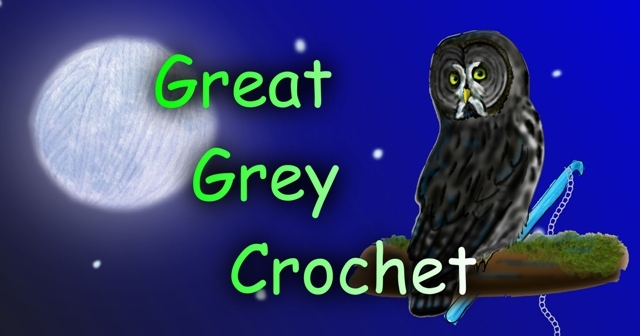 He's not the reason I called my blog Great Grey Crochet; I just like great grey owls. Though, he is one of my most favorite characters. Get ready. Embroidery circle on face with very dark grey. Embroidery yellow beak. Use the black thread and needle to embroidery rings on face. (You my want to use yarn instead of thread, because it looks a little funny) Embroidery white eye brows and beard. Place yellow felt around eyes and put them in face. Embroidery stripes in Head/Body and Wings with very dark grey yarn. Slst tog wings and sew them onto sides of Head/Body. Sew legs onto bottom. I'm not completely satisfied with him and plan to make a better looking Twilight soon. And I will get pictures of him outside. Twilight the character belongs to Kathryn Lasky, but the pattern belongs to me. He is very nice. I will needle felt him for you... eventually. hello! how tall did he turn out? :) i would like to make one and would like for him (Errol to me) to be around the same height as my 10-inch Hedwig. :D thanks! this is lovely! Hi! He is almost 8in, so I guess you would need to use a bigger hook size and/or thicker yarn if you wanted him to be bigger. Sorry it took me so long to reply!